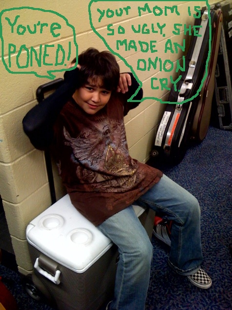 "Poned" (or "pwned") is a corruption of the word "owned" and originated on internet RPG games. It's meaning is "to own" or to diss, etc. The Jonas Brothers' meaning (as well as spelling) varies from the traditional uses of the word and they claim to have learnt it from an unknown kid that repeatedly said that he "poned them." (As stated on Greg Garbo's personal blog.) It later became an inside joke with the trio and their back-up band. "This little menace you're looking at here is the originator of the word "poned." It happened by a chance encounter last summer when he strolled onto our tour bus and started making fun of our production manager. no one knew who he was, why or even how he got on our bus. but as the legend goes, he began to verbally berate and belittle a 35 year old man who he didn't know at all; all the while yelling at the top of his lungs "OOOHHH!!!! YOU JUST GOT PONED!!!" to this very day, i have never seen anything like it. at one point our production manager said to him, "if i hear another word out of you, i'm kicking you off this bus." to which the Ponemaster counteracted with, "if i pone you one more time, it'll be a new world record." his pones covered a wide range of topics, including, but not limited to: your mom, ugliness, weight, age, your job…virtually anything. He said the word "poned" was formed as a combination of other diss words such as "punk'd" "burned" "owned" "schooled" etc. he is truly a special kid. It took practically no time for us to think this was absolutely hilarious and adopt the word into our vernacular and it hasn't left since." 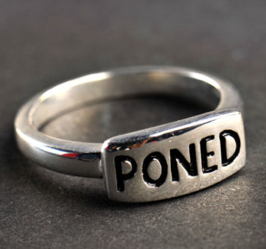 "Poned" has become a word very near and dear to the hearts of most Jonas fans, whom of which use the term in custom tee-shirts, graphics, and everyday life. 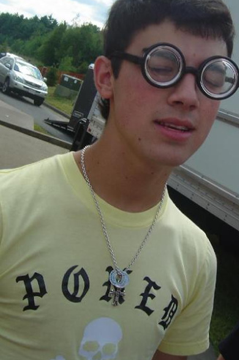 Joe Jonas has been known to where shirts with the term "Poned" written across. Also, Nick Jonas' old purity ring that he had made in Disney World has the word engraved on the front. And the Jonas Brothers merch website released a ring inspired by Nick's available to purchase for $12 online.